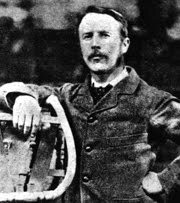 Henry Fleuss (1851-1933) was a diving engineer for Siebe, Gorman & Co. of London. He is widely recognized as a pioneer in the field of diving and some even credit him as the first SCUBA diver. You didn't think it was Jacques Cousteau, did you? Though he is credited with many other inventions including the Fleuss vacuum pump and a steam car, it is widely accepted that his most important was for the first self-contained breathing apparatus (SCUBA) using pure compressed oxygen. 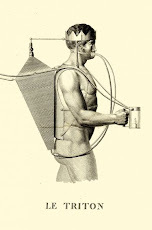 Originally designed in 1876, he was granted a patent for the apparatus in 1878 which freed the diver from having to rely on breathing surface-supplied air. The apparatus consisted of a rubber mask, a breathing bag, a copper tank to hold the oxygen, and a scrubber. The closed-circuit system was designed to reuse the oxygen by removing the carbon dioxide using a rope yarn soaked in a solution of caustic potash. Originally used to rescue mine workers, Fleuss was lauded for this early SCUBA apparatus. Its revolutionary and brilliant design became an invaluable piece of equipment for military operations during WWII. The Fleuss rebreather came to be preferred over all other available diving apparatus because it offered the diver total concealment (no air bubbles!). Although the Fleuss rebreather limited the diver's working depth due to the threat of oxygen toxicity, it was truly revolutionary and is without a doubt a very important part of diving history. Visit the Museum to learn more about early rebreathers and the evolution of other early SCUBA equipment! Excellent information, thanks for sharing this great post.